Home ssc notice Recruitment of Sub-Inspectors in Delhi Police, CAPFs and Assistant Sub-Inspectors in CISF Examination, 2017 – Additional list of candidates for appearing in document verification on the basis of DME/ RME. Recruitment of Sub-Inspectors in Delhi Police, CAPFs and Assistant Sub-Inspectors in CISF Examination, 2017 – Additional list of candidates for appearing in document verification on the basis of DME/ RME. The Staff Selection Commission had declared the Result of Medical Examination, shortlisting candidates for Document Verification vide its write up dated 26.09.2018. 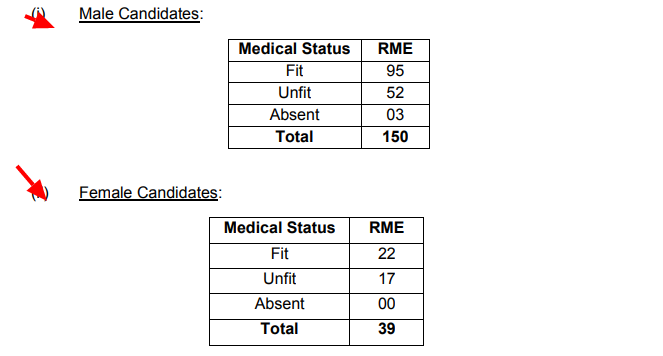 The Commission has now received from Central Armed Police Forces (CAPFs) an addition data of 184 candidates of SSC (NR) and 05 candidates of SSC (NWR), who were declared unfit in DME and had subsequently appeared in the Review Medical Examination (RME).